The event will include presentation of our 2017 Annual Report and Accounts and an explanation of key activities planned for the forthcoming year. The report can be viewed by clicking on the cover image to the right of this text (hard copies available at the meeting). 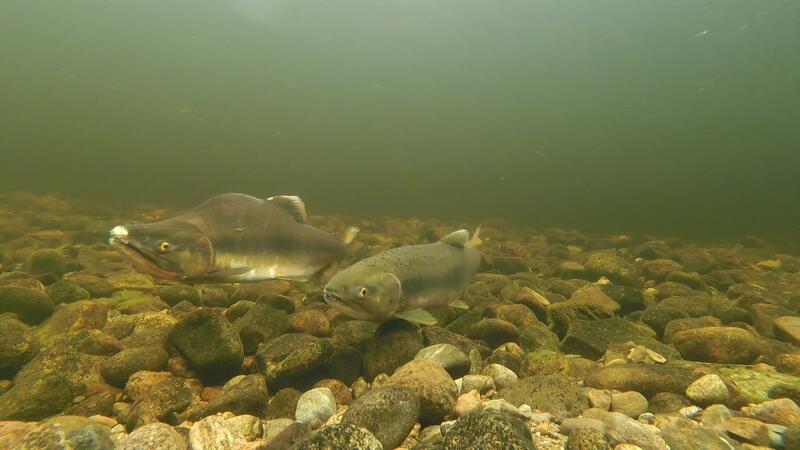 Our guest speaker Marina Gibson will talk about her role as an Atlantic Salmon Trust Ambassador and what research they are doing, then talk about her background and passion for fishing. Please see the notification and final agenda for the meeting. This meeting is open to the public. Places are limited to 50 seats. Please contact Chris Conroy (Clerk) at ceo@ndsfb.org or 01463 861245 to register an interest in attending. 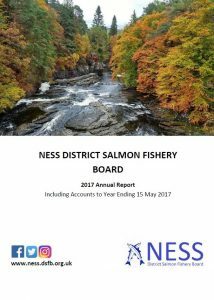 The Ness District Salmon Fishery Board’s ‘2017 Annual Report and Accounts’ were approved at our Annual Meeting of Qualified Proprietors on the 14th December 2017. A low-resolution version can be viewed by clicking on the cover image to the right of this text. Hard copies will be available at our Annual Public Meeting on the 18th January 2018. The key purpose of our Annual Public Meeting is to report to the local community on our activities over the last year and to seek wider engagement in fishery board business. It will include presentation of our 2017 Annual Report and Accounts and an explanation of key activities planned for the forthcoming year. The final agenda for the meeting will be published during the week commencing 8th January 2018. 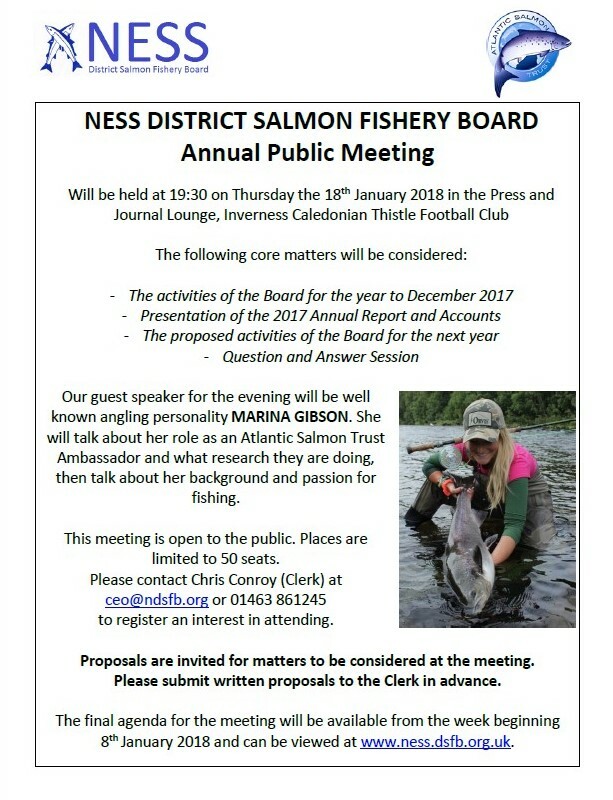 The agenda for the forthcoming Ness District Salmon Fishery Board ‘Annual Meeting of Qualified Proprietors’ at Inverness Caledonian Thistle Football Club on Thursday the 14th December 2017 can be viewed here. This will be followed by an ordinary board meeting, the agenda for which can be viewed here. These meetings are open to the public. It would be helpful in planning seating etc. if you could contact Chris Conroy, Clerk to the Board at ceo@ndsfb.org if you are interested in attending. A minute of the Pacific pink salmon workshop held in Edinburgh on 21 September 2017 can be viewed here. 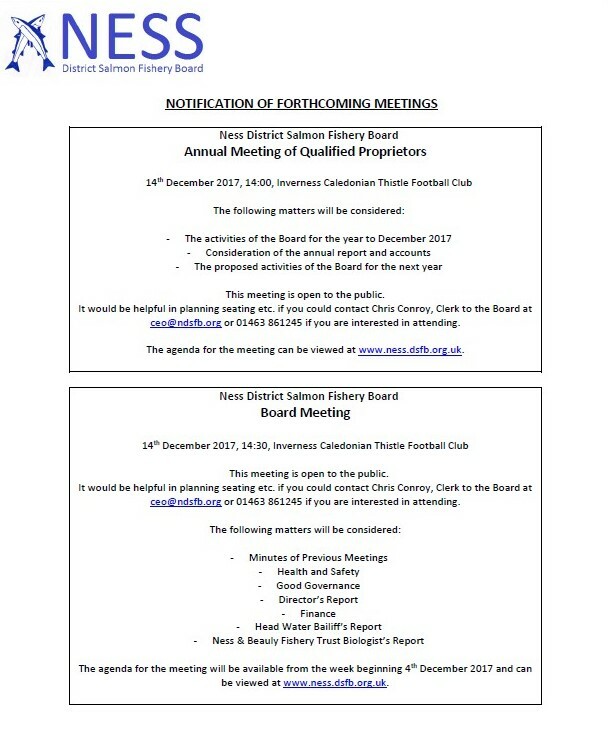 The agenda for the Annual Meeting can be viewed here, with the agenda for the board meeting being available from the week beginning 4th December 2017. 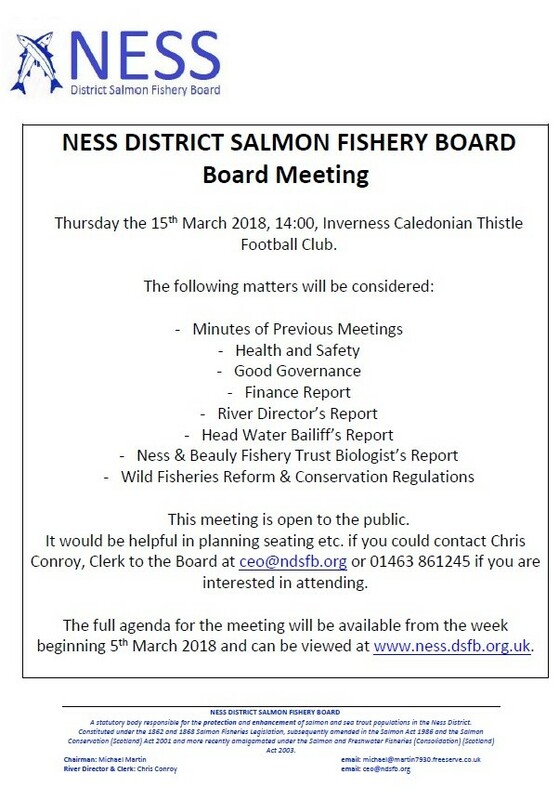 The agenda for the forthcoming Ness District Salmon Fishery Board meeting at the Inverness Caledonian Thistle Football ground on Thursday the 14th September 2017 can be viewed here. This meeting is open to the public – it would be helpful in planning seating etc. if you could contact Chris Conroy, Clerk to the Board at ceo@ndsfb.org if you are interested in attending.